Our father among the saints John the Merciful was patriarch of Alexandria in the early 7th century, also known as John V of Alexandria. He gained his epithet from his unstinting generosity in distributing the vast wealth of the patriarchate of Alexandria to the poor and afflicted. The main source for his biography is a Life written by Leontius of Neapolis in Cyprus. John is commemorated in the Orthodox Church on November 12. John was born in Amathus on Cyprus c. 550 to the patrician Epiphanius, a governor of the island. He married and had children, but was a widower when he was called to become patriarch of Alexandria on the recommendation of his friend, the city's imperial prefect Nicetas. The Chalcedonian see of Alexandria had been vacant since the death in 609 of Theodore during the capture of the city by Nicetas. In 611 John assumed the throne, becoming the fifth Chalcedonian bishop of Alexandria to bear that name. John was remarkable for his almsgiving or mercy (ἐλεημοσύνη in Greek, hence his title Ἐλεήμων). To someone who was astounded at his generosity he recounted a vision he had seen in his youth in which Compassion appeared to him as a beautiful maiden and told him that she was the eldest daughter of God. The patriarchate of Alexandria had at its disposal immense wealth in both money and commercial enterprises, including shipping, and John put it all at the disposal of the poor. He was not only liberal with the resources of his see, but with his own goods. In one incident in his life he felt remorseful for accepting a richly-embroidered blanket as a gift and was unable to sleep until he sold it and gave the proceeds to the poor. He also made himself available to anyone who had a petition, grievance, or request. His generosity did draw censure at times. In one case one of his aides noticed that someone was abusing the distribution of goods in John's very presence, returning several times in different guises, but when he mentioned this John replied that it might be Christ in disguise. In another case he came to loggerheads with his friend Nicetas when the latter, concerned to contribute to Emperor Heraclius' war effort against the Persians, tried to appropriate some of the church's wealth to that end, an attempt which John firmly resisted and which ended in Nicetas' apology. His care was not limited to his own flock in Alexandria, but extended to the people of Palestine in their sufferings during the Persian invasion and sack of Jerusalem. John sent convoys of essential supplies to Palestine and welcomed many refugees to Alexandria. John took care of spiritual as well as bodily nourishment and in meals and other gatherings in the patriarchal palace would only converse on the Scriptures or other spiritual topics. He also patronized the learned wanderers St. Sophronius, future patriarch of Jerusalem, and John Moschus, author of the Leimonarion (Spiritual Meadow). John has been considered an example of religious tolerance during the divisive Christological disputes of Late Antiquity, but the evidence for this is mostly negative, as he is not presented in his Life as using violence to impose Chalcedonian Orthodoxy. It is clear from his Life that he was a firm supporter of Chalcedonian doctrine and that he used the theological ability of men such as Sophronius and John Moschus to defend and promote it. As a result of his efforts the number of Chalcedonian churches in the city increased ten-fold during his reign, according to his Life. John voiced opposition to Heraclius' early attempts at promoting monoenergism as a compromise solution to the schism over Chalcedon, but did not participate in the major controversies that soon developed. He was forced to flee Alexandria by the Persian invasion of Egypt in 619. Returning to Cyprus, he died soon thereafter. A few years later much of John's work of reconciliation with the Non-Chalcedonians of Egypt was undone by the violent persecution instituted by Cyrus, who combined both imperial and ecclesiastical authority as dual prefect and patriarch of Alexandria. The Life by Leontius along with several interpolations from other sources can be found in Dawes and Baynes, Three Byzantine Saints (Crestwood, NY: 1977). A good recent summary can be found in the new Synaxarion written by Hieromonk Macarius of Simonopetra, Christopher Hookway (trans.) The Synaxarion: The Lives of the Saints of the Orthodox Church: Volume 2: November, December (Ormylia Greece 1999) under the entry for November 12. John's relations with non-Chalcedonians are treated briefly in John Meyendorff Imperial Unity and Christian Divisions: The Church 450-680 A.D. (Crestwood NY 1989). 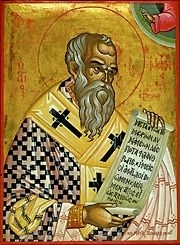 Meyendorff's statement that John is venerated as a saint by the Coptic and Ethiopian Churches seems to be a confusion with John IV, Coptic Pope of Alexandria of the late 7th century, also surnamed the "Merciful" but presented as a staunch opponent of Chalcedonian Christology (see the Coptic Encyclopedia). The most recent scholarly study of Leontius of Neapolis, the author of the main Life of John, is Vincent Deroche, Études sur Léontios de Néapolis, (Uppsala 1995). Online, entries can be found on Wikipedia at St. John the Merciful and on the Catholic Encyclopedia under St. John the Almsgiver. This page was last edited on December 1, 2016, at 23:17. This page has been accessed 39,081 times.